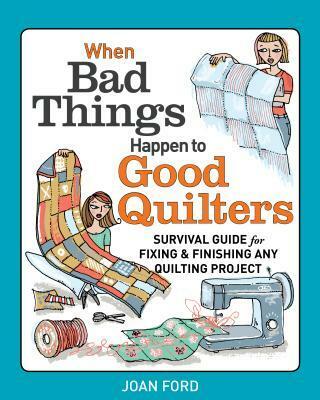 This is the go-to-guide to rescuing wayward quilting projects. It tackles problems that arise for novice and more experienced quilters. It comes from famed creator of ScrapTherapy[registered] programme Joan Ford. Quilters don't give up, but they might move on-temporarily. A quilt is always started with the best intentions, but more often than quilters like a difficult technique, mismatched fabrics, or a mistake in the pattern brings the project to a grinding halt. Joan Ford, creator of the famed ScrapTherapy[registered] programme and author of two ScrapTherapy[registered] books, likes to call these UFOs (Un Finished Objects) - and quilters' shelves are lined with them. To get stalled projects going again, sometimes a little helpful instruction is all that's needed. Joan's funny, can-do voice and practical problem-solving approach is exactly the guidance that all quilters need. From talking novices through the quilting process to helping more experienced quilters resolve complicated setbacks, this is the tool they need to troubleshoot and to get (and keep) projects back on track.